The Union of Agricultural Work Committees (UAWC) today warned from the Israeli civil administration’s project E1, which aims to conduct six structure plans annexed to each other, forming a new settlement, after they relocating the Bedouin Palestinians from their homes near Jerusalem and Nuway’imah, and, therefore, seize their homelands in the C areas, where settlements are already being built. According to the PNN, the report showed that about half a million dunams of lands will be evacuated, according to the Israeli project which is already being implemented. These areas will be converted into settlements, military training zones, in addition to nature reserves, making it impossible for the Bedouins to return to their homes, in addition to the catastrophe of ripping the occupied West Bank into two halves. According to the United Nations Office for the Coordination of Humanitarian Affairs (OCHA) and the UAWC follow up, the project will seize 1460 dunams, in which about 12,500 Bedouins live in 46 communities. The project will “give” about 450 Square meters for every Bedouin family, with restricted permits of use; they can build only one story for housing, and another one of 25 square meters as a forage store for their livestock, which is sufficient and will push them to sell their sheep, and become workers in the settlements, making them consumers instead of producers. Palestinian family members, including a 70-year-old elderly woman, were attacked at dawn Tuesday by Israeli occupation officers who rolled into Jerusalem’s town of Silwan and reduced two homes of the family’s own to rubble under the pretext of unlicensed construction. Eye-witnesses said Israeli occupation policemen, escorted by army bulldozers, suddenly showed up in Wadi Helwa neighborhood, in Silwan, and broke into Abu Khaled’s family home at 4.30 a.m. moments before they aggressively attacked the family members, four among whom, including a 70-year-old elderly woman, were left wounded. A PIC news reporter identified the injured family members as 22-year-old Hashem Abu Khaled, Nur al-Deen Abu Khaled, 22, Ezzedine Abu Khaled, 24, and Fatma Abu Khaled, 70. The Israeli cops who cordoned off the area from all sides also pepper sprayed the family shortly before they started to knock down the two buildings via a bulldozer. The house owner Nidhal Abu Khaled said the Israeli police locked up all family members inside the building and initiated the demolition procedure under the pretext of unlicensed construction. He added that the targeted buildings, under construction since last November, cover 70 square meters each. 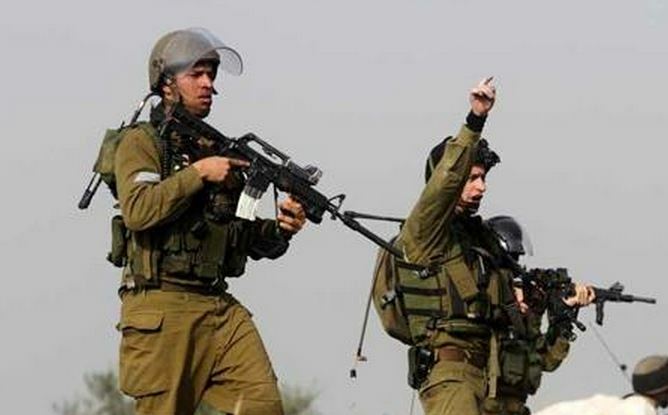 Israeli soldiers and members of the “Civil Administration Office” run by the army in the occupied West Bank, invaded Tuesday Um Salmouna village, south of Bethlehem, and handed orders against four under-construction homes. The army claimed the homes were being built without permits, and informed the families they needed to stop the construction work. Head of the Um Salmouna Village Council Mahmoud Taqatqa said the homes belong to Hussein Mohammad Taqatqa, Ja’far Khalil Taqatqa, Nassim Ali Taqatqa and Salim Ahmad Taqatqa. Each home is around 200 square meters. The village is subject to repeated violations and lost large areas of its lands to the military, Israel’s illegal colonies and bypass roads. Approximately 16.2% Dunams of its lands are isolated behind the Annexation Wall, in the western area of the village. Approximately 79.8 (1738 square kilometers) of the village’s lands are classified as Area C in the Oslo Peace Agreement, under full Israeli military and administrative control. Israel was supposed to hand control of parts of Area C to the Palestinian Authority in 1999, and was to withdraw from Areas A and B. Area C includes fertile Palestinian lands, natural resources and open areas that are supposed to be under the future Palestinian State, but Israel kept building and expanding its illegal settlements, in addition to annexing more lands for its military. Last year, the United Nations Office for the Coordination of Humanitarian Affairs in the occupied Palestinian territory (OCHA) said 297.000 Palestinians live in 532 residential areas in Area C that represents more than 60% of the occupied West Bank. Palestinians living in Area C lack basic services, including health-care centers, in addition to ongoing attacks by Israeli settlers, while the army conducts live fire training (in %18 of the West Bank) close to population centers, and the residents largely have insufficient access to basic infrastructure. The division between the three areas (A, B and C), set under the Interim Agreement of 1995, was supposed to be dissolved in five years, but Israel never implement this important part of the agreement. Area A, under supposed “Palestinian civil control and police authority, is only %17.7 of the West Bank, while Area B is under Palestinian “Civil Control”, and supposed to be under joint Palestinian-Israeli Security Control. 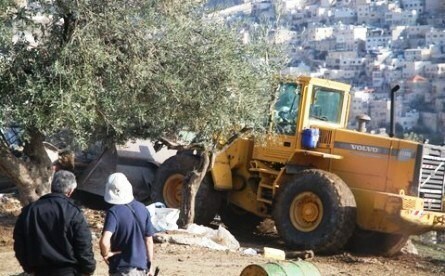 Bashar Qaryouti, Coordinator of Popular Committee against the Wall and Settlements in Qaryout village, south of the northern West Bank city of Nablus, said Israeli extremists bulldozed and uprooted, on Tuesday morning, Palestinian lands in preparation to pave a road linking between two illegal colonies, built on the villager’s lands. Qaryouti said the planned illegal road is meant to link between Shilo and Eleya colonies, built on privately owned Palestinian lands. He added that the new Israeli plan would lead to further illegal annexation of Palestinian lands, and to destroying the southern road of the village. 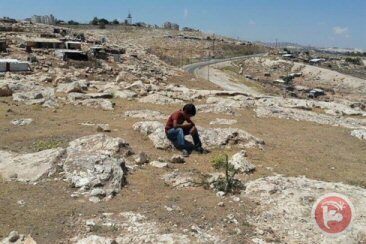 Qaryouti said the village’s size with its lands used to be 22.000 Dunams; all but 366 Dunams have been illegally annexed by Israel to the construction and expansion of settlements, and for military usage, the WAFA New Agency has reported. He also stated that the villagers managed to obtain a ruling from the Israeli Supreme Court denying the settlers access to the bulldozed area, as it contained an archaeological site, but they violated the order. In addition, Ghassan Daghlas, in charge of the Israeli Settlements File in the Palestinian Authority, in the northern part of the West Bank, has reported that Israeli bulldozers also uprooted Palestinian lands, close to Road #60, linking between Nablus and Ramallah. Daghlas stated that Israel is apparently planning to illegally confiscate dozens of Dunams of Palestinian lands to link the two above-mentioned colonies. 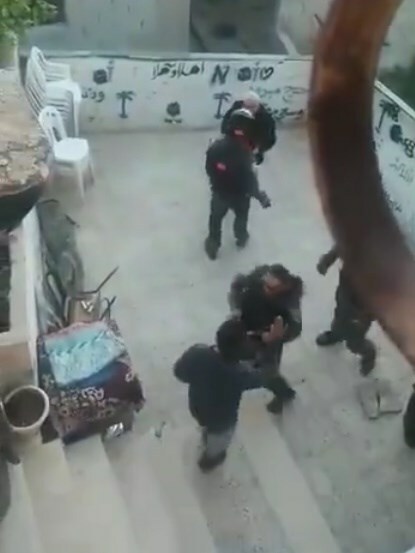 Resident Nidal Abu Khaled, owner of two of the demolished homes, said the soldiers stormed his property, approximately at 4:30 at dawn, and attacked the family with pepper-spray before forcing them out. 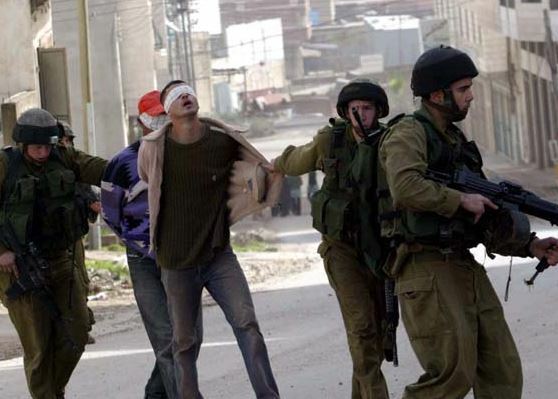 The soldiers then demolished the two homes, and kidnapped Nidal’s nephew, Hisham Abu Khaled. One of the homes was 180 square/meters while the other is 80 square/meters; they were built last year, and the family filed numerous appeals in Israeli court, but a ruling against the two building was finalized earlier in May. He added that the army invaded the area two weeks ago, but could not demolish the building due to the existence of many stairs leading to the building, but today, the soldiers came equipped with special machinery that enabled the destruction of his property. In addition, soldiers demolished an apartment on the top third floor of a residential building in Salah Ed-Deen Street, belonging to resident Rafiq Salayma. Salayma said he has been living in the building, along with his eight other family members, for the last six years. The soldiers demolished it because its sealing collapsed during the snowstorm, this past winter, and the family managed to fix it, but the City Council ordered its destruction. Israeli military bulldozers razed at noon Monday an agricultural structure claiming closeness to Salem military camp to the north of Jenin city. 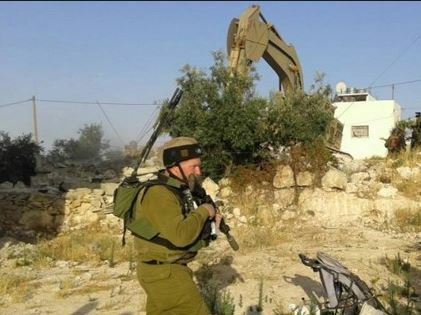 Local sources said that Israeli soldiers in several patrols and a bulldozer demolished the agricultural facility which belongs to a Palestinian man in Rummaneh nearby town. The Israeli forces warned the owner against trying to rebuild the facility which constituted of a water well and a room, the sources added. 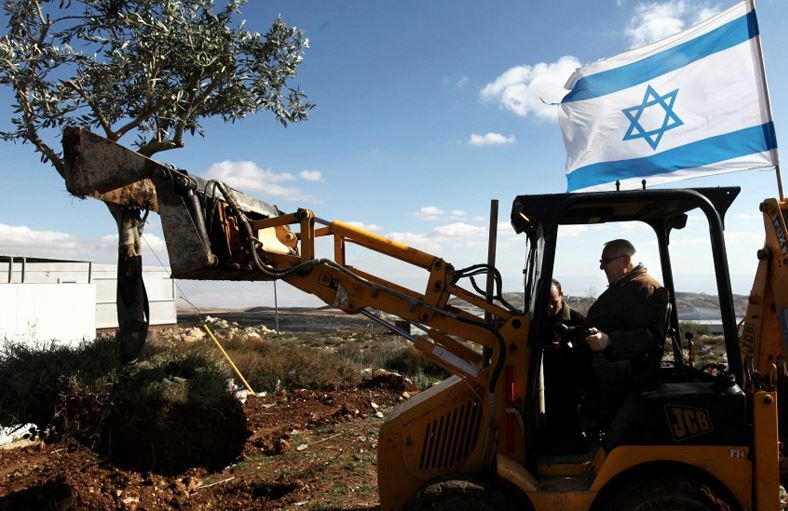 The owner of the farm underlined that the forces razed his farm and uprooted the olive trees despite possessing official ownership documents. Israeli military bulldozers have laid Sunday afternoon a settlement road at the expanse of Palestinian-owned land to the south of Nablus. 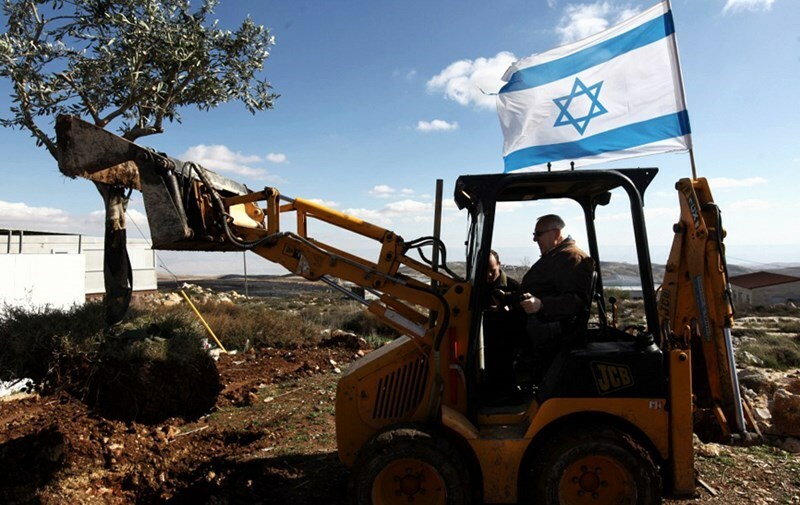 Eyewitnesses told PIC reporter that Israeli bulldozers have established under the protection of nearly 50 Israeli soldiers a new settlement road within about 150 meters in Assira town in the city. The settlement road, that links between an Israeli military site with the main water tank in the area, will prevent nearly 20 Palestinian farmers from reaching their agricultural lands, the sources added. Assira town is daily subjected to Israeli settlers’ systematic attacks under Israeli forces’ protection as it is located between Yitzhar and Bracha illegal settlements. Israeli soldiers kidnapped, on Monday at dawn, nine Palestinians in different parts of the occupied West Bank, including Jerusalem, and handed a family near Jenin an order to demolish their artesian well. One Palestinian was kidnapped on Sunday evening. Media sources in Bethlehem said several army vehicles invaded Husan town, west of the city, broke into and violently searched several homes and kidnapped three Palestinians. The kidnapped residents has been identified as Mohammad Jamal Zaghoul, Mohammad Ali Hamamra and Mohammad Ahmad Shousha. Soldiers also invaded the Balata refugee camp, in the northern West bank city of Nablus, and kidnapped Mohammad Salah Hejazi, 31, after searching his home. One Palestinian, identified as Sameh Othman Ramadan, from Tal village near Nablus, was kidnapped on Sunday evening on a military roadblock near the village. In addition, soldiers invaded the Dahia area, in Nablus city, and kidnapped a Palestinian journalist, identified as Ahmad al-Beetawi, 33, after storming his home and searching it. Also on Monday at dawn, soldiers invaded the northern West Bank city of Jenin, and the Jaba’ nearby town, and kidnapped two Palestinians. Resident Ghassan al-Atrash, 40 years of age, was kidnapped from his home in the Eastern Neighborhood in Jenin. The soldiers also invaded and searched the homes of his brothers ‘Ala, Husam and Adnan, in addition to their father’s home. The soldiers also invaded Ta’nak village, west of Jenin, and handed resident Suleiman Suleiman a military warrant, ordering him to demolish his artesian well, under the pretext of lacking the needed permits. In Jaba’ town, south of Jenin, soldiers invaded several homes, violently searched them, and kidnapped Amin Emad Kan’aan, 20 years of age. The soldiers also clashed with local youths, and fired scores of gas bombs and rounds of live ammunition, causing many residents to suffer the effects of tear gas inhalation. Two more Palestinians were kidnapped from their homes in Silwan town, south of the Al-Aqsa Mosque in occupied East Jerusalem, after the soldiers searched their homes and many other homes in the town. The two have been identified as Khalil Odeh and Amer al-Abbassi; they were moved to an interrogation facility in the city. On Monday morning, soldiers installed a roadblock on the main entrance of Beit Ummar town, north of Hebron, and detained several Palestinians while investigating their ID cards and interrogating them. On a day like many others, Mrs. Um Yehia went to feed her sheep in her family's fields in Susya, South Hebron Hills, next to an Israeli settlement. But this time around, she got an unpleasant surprise. "Two settlers came to me. They harassed me and tried to steel my sheep," Mrs Um Yehia recalls from her house in Susya village, Area C in the West Bank. Fellow villagers soon came to her rescue, but the whole incident had made her feel both anxious and sick. Um Yehia's case is far from exceptional. Villagers of Susya describe how they have faced harassment from settlers since the IOF occupied the lands 30 years ago. In 1986, the Israeli army demolished the caves that the villagers had been living in for decades, claiming Susya was an important Jewish archaeological site. "My family used to live in the old Susya but were forced displaced. They were shocked and did not understand why" Mr Um Yenia explains. Most villagers thought the displacement was temporary. But as years passed by, they realized they would never be able to return and so, they started building new caves during the 1990's. In 2001, the new caves were also demolished, as the IOF claimed the Palestinian villagers were constructing an illegal settlement. 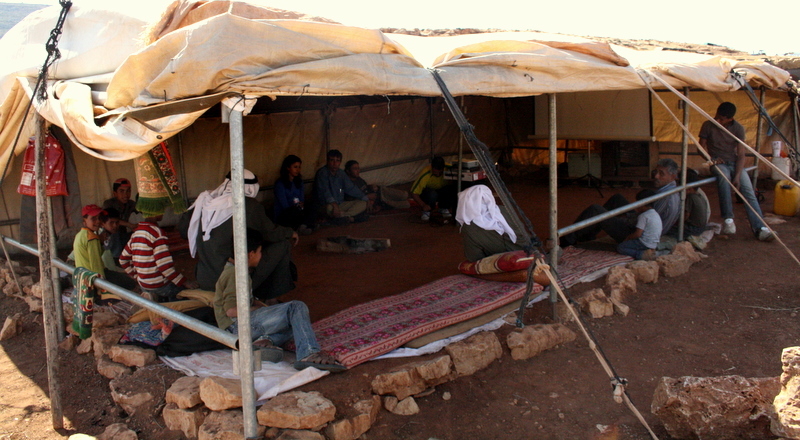 Not having a roof over their heads, the Susya residents were forced to erecting the tents in which they are living today. To the family of Um Yehia, the harassment from settlers (at times occurring on a daily basis) is an evidence of the unjust and lack of legal protection prevailing in the area. After the incident with the two settlers, who tried to steel Mrs Um Yehia's sheep, she filed a complaint to the Israeli authorities, hoping for some protection. But the IOF ended up categorizing her as the security threat. "That is how it works around here. You ask for your right and end up losing even more of it! Today, I am still considered a security threat although I was the violated part" she says. "One time, an Israeli police officer went undercover here to see if the villagers were really speaking the truth. He dressed up as a Palestinian and started shouting, " This is our land". The settlers attacked him, and fortunately, it was filmed by the Channel 2 so we could prove ourselves right. It became a big story in the media" he says. 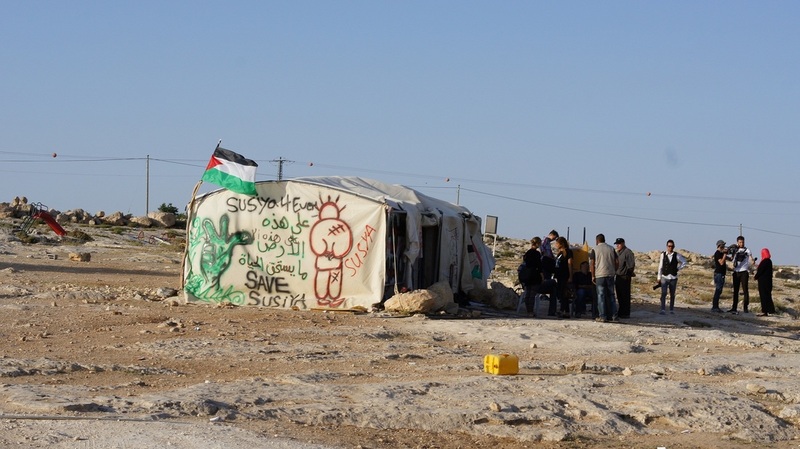 As if two forced displacements and daily harassment were not enough, the Israeli High Court of Justice on 5 May ruled to allow the IOF to demolish the entire village of Susya and expel its residents. Mahmoud Zwahre of the Popular Struggle Coordination Committee explains how the relocations are part of a greater plan to displace Palestinian communities from Area C to Area A, where they are cramped together. "They are not only targeting Susya, but villages in the area from Jericho to Jordan Valley to South Hebron Hills," he says. As for the Um Yehia family, they have no intention of falling into line with the new ruling by the High Court of Justice. "I am not leaving. I am staying in this land, which belongs to my ancestors. We have raised our heads and healed our wounds many times, and we will do it again. The Israelis may be experts in demolishing houses, but we are experts in defending ourselves" says Mr Um Yehia. He calls for international activists to come and stay with the villagers for protection. "We need their help, because we never know when the IOF will come." On 27 of May, 2015, The Jerusalem Center for Legal Aid and Human Rights (JLAC) through its legal Unit, and the Attorney, Mohamed Abbassi succeeded in issuing new injunction orders, through the Israeli High Court of Justice, to freeze dozens of demolition orders against the Bedouin Communities in the Fasayil village. The village is located in the Jordan Valley northeast West Bank, and considered as a habitat for dozens of Bedouin families. The legal intervention is in line with the continuing efforts to protect the Bedouin communities from forced displacement by the Occupation Authorities in the Jordan valley. The new injunction orders included freezing dozens of demolition orders against more than 30 facilities and structures, mostly used for livestock breeding, considered a major source of livelihood for the affected families. This legal achievement comes in parallel with submitting dozens of objections on behalf of Bedouin Communities against the Israeli Civil Administration's plans to relocate and cluster the Bedouin communities in to confined areas near an Nwei'ma, Fasayile and East Jerusalem. Clustering and relocating the Bedouin Communities compromises their fundamental rights, and is considered a clear violation and abuse to the provisions of the International Humanitarian Law and International Human Rights Law. Al Rashayda community is composed of three extended families, living in the area since two decades approximately, and seasonally sharing their lands with other families. They have been in Fasayel after they were displaced from the nearby AlOja village. Their homes and barracks were demolished 3 times in the previous years, due to the arbitrary policies of the Israeli authorities through the Civil Administration (ICA), where the families were handed immediate eviction orders,sometimes without even giving them the appropriate time to submit objections which is supposed to be guaranteed by the law; such was done, under the pretext that the land they reside on an antiquity site and registered as state land. The Jerusalem Center continues to provide legal assistance to the affected population and its steadfastness since 2009, where the center succeeded in freezing dozens of the demolition and deportation orders since then. Israeli soldiers attacked, Saturday, scores of Palestinian and international peace activists protesting in front of the Al-Baraka home, near the main Jerusalem-Hebron Road, north of the southern West bank city of Hebron, and kidnapped one Palestinian. The soldiers kidnapped Yousef Abu Mariya, 45, of the Popular Committee against the Wall and Settlements, after attacking him, and took him to an unknown destination. The protesters marched carrying Palestinian flags and chanting against the ongoing illegal Israeli settlement activities that aim at controlling more Palestinian property and farmlands. Soldiers attacked the protesters as they marched demanding the removal of extremist Israeli settlers who controlled on old church property, that was constructed as a free tuberculosis treatment center, known as Beit al-Baraka (House of Blessing) more than 70 years ago on 35 Dunams; it shut down in 1983. Coordinator of the Popular Committee against the Wall and Settlements Rateb Jabour said the soldiers attacked the protesters, and tried to prevent them from reaching the site, but they managed to advance. He added that the protest came to express rejection to Israel’s illegal policies and violations against the Palestinians in different parts of occupied Palestine, especially in areas close to illegal Israeli colonies, built on Palestinian property and lands. It is worth mentioning that a Swedish lawyer, who represents Beit al-Baraka, denied Israeli allegations that the settlers have purchased the property and the lands around it. The lawyer said the recent maintenance and construction work in the place is part of the owners’ decision to turn the property into a hotel and park, not a settlement. The settler named the property Bet Bracha. More than a week ago, Israeli newspaper, Ha'aretz, right-wing settler, Aryeh King, has allegedly purchased a compound of an abandoned church, three years ago, and started working on it to create a new outpost. The new settlement is meant to house at least 20 families in the already refurbished eight buildings, including a large commons structure. Ha'aretz said that the settlers have been conducting massive reconstruction for the last several months, and built a fence around the compound, challenging an order by the Civil Administration Office in the Occupied West Bank, as no permit was issued for the fence. As Israeli settlement expansion continues in the eastern part of the West Bank, in the Jordan Valley, another set of eviction/demolition notices were issued by the Israeli military authorities to Palestinian families on Thursday. These demolition orders are just the latest in a series of orders handed down by the ruling military, which governs the West Bank by martial law, to the indigenous Palestinian population of the Jordan Valley. The families who received the notices were given three days to vacate their homes before Israeli armored bulldozers (usually Caterpillar D-9 models, manufactured in Illinois) arrive on the scene to turn their homes to rubble. 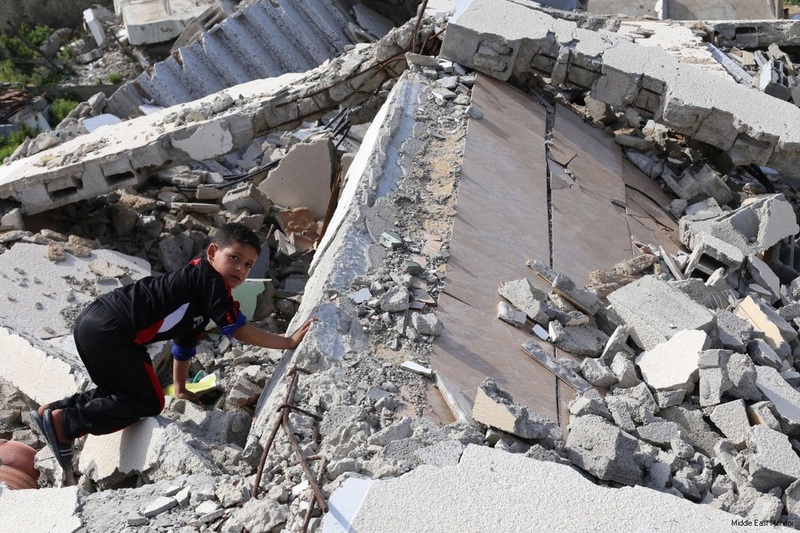 The families receiving demolition orders on Thursday were identified by the Wafa News Agency as: Ibrahim Salem, AlI, Dawood, Ahmad, Ibrahim, and Yousif Ebaidat, Ali Hassan, Aziz Suliman, Suliman Sawarka, Dawoud Ebaidat, Ibrahim Ebayat,Yousef Nawawra, and Mahmoud Abu Kharbish. These are all families in the village of al-Fasayil. In the nearby village of Al-Jiftlik village, demolition orders were issued to Mahmoud Edis , Rasheed Morshed ,Omar Abu Razqa and Mut’eb Atawna. No explanation was provided by the Israeli military authorities for the decision to demolish the 14 homes. The families were told siply that they must get out of their homes and find somewhere to go, with all their belongings, as the Israeli military will arrive on Sunday to destroy the homes whether or not the residents are present. In January, the UN Office for the Coordination of Humanitarian Affairs issued a report detailing the evictions and demolitions that month alone, which had resulted in the displacement of 77 Palestinians. In their report, UN OCHA stated that "Demolitions that result in forced evictions and displacement run counter to Israel’s obligations under international law and create unnecessary suffering and tension. They must stop immediately." Israeli Occupation Authority (IOA) issued demolition notices to raze 15 Palestinian houses in middle Jordan Valley. 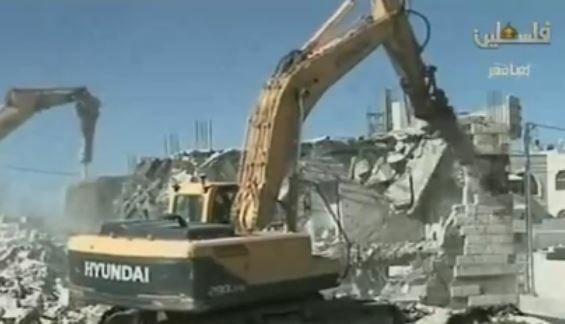 The President of the village council of Wadi al-Maleh and Bedouin homes, Aref Daraghmeh, told Quds Press that the notices are final and the demolition will be implemented after three days. He revealed that the facilities to be razed constitute of housing tents for Bedouin families and their animals. Daraghmeh said the IOA claims that the structures lack building permits which is so difficult to obtain for Palestinians whereas it is so easy for Jewish settlers. He pointed out that lawsuits have been filed to Jericho Governorate which had in turn filed it to Israeli courts. No response has yet been received from Israeli courts. "If the demolition decision is not changed, the Palestinian Bedouin families will be displaced with no shelter left for them in the extremely hot summer," he said. The Bedouin areas in Jericho have been facing harsh Israeli settlement policies of deportation and displacement of the Bedouin families living in the Jordan Valley. In an ongoing campaign by Israeli authorities to push Bedouin communities from the Negev, Israeli bulldozers demolished the home of Ali Hammad Abu Rabia in the Makhul village Thursday, locals said. His home is the third belonging to the Abu Rabia family to be demolished by Israel in the last eight years, according to Ma'an News Agency. Israeli forces closed all entrances to the village while bulldozers demolished the house, locals said. Ali Abu Rabia told Ma'an that the demolition comes as locals face pressure from Israeli authorities, based on negotiations concerning ownership of lands belonging to the family in different areas in the Kuseifeh and Makhul villages. "We presented a license application for the house and they told us that no more licenses will be given to houses in the Makhul village that were only recognized on paper," Abu Rabia said, adding that the family had built the home three years ago on their own land, so, were surprised when the Israeli Land Authority said that the land belongs to the state. The demolition of the Abu Rabia home by Israeli forces comes as the Israeli Supreme Court gave the green light to confiscating the land of two Bedouin villages, earlier this month. The court approved military orders to demolish the Bedouin village of Susiya south of Hebron and relocate its 340 Palestinian residents, and registered 1,000 dunams (250 acres) of land belonging to Sheikh al-Ukbi under the name of the Israeli development authority. "It is a sad day when Israeli Supreme Court decisions provide legal cover for forced evictions, as in the case of these two villages," Sarah Leah Whitson, Human Rights Watch's (HWR) Middle East and North Africa director said in a statement following the court decision. According to HRW, there are thousands of Bedouins in Israel living in unrecognized Negev villages that are under constant threat of demolition. 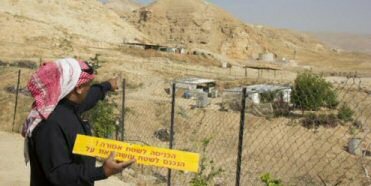 Ongoing pressure on Negev communities comes as Israeli Justice Minister Ayelet Shaked said earlier this month that a High Court ruling to destroy the Bedouin village of Umm Hiran and replace it with Jewish housing was "not discriminatory," reported Israeli news source Haaretz. Shaked is a member of the Jewish Home party which conditioned joining Netanyahu's coalition on reinstating the Prawer Plan to permanently resettle the Bedouin, which would potentially forcibly displace up to 70,000 Bedouins living in the Negev. "We are being targeted by the land authority," Abu Rabia told Ma'an after his home was demolished. "The houses of my two brothers, Yasser and Tayssir, were demolished 8 years ago and the Israeli authorities do not want to recognize our ownership of the land that we inherited from our ancestors." Abu Rabia called upon Palestinians in Negev to hold on to their lands as "Israel aims to uproot us from our lands and turn us into strangers in our own homeland."